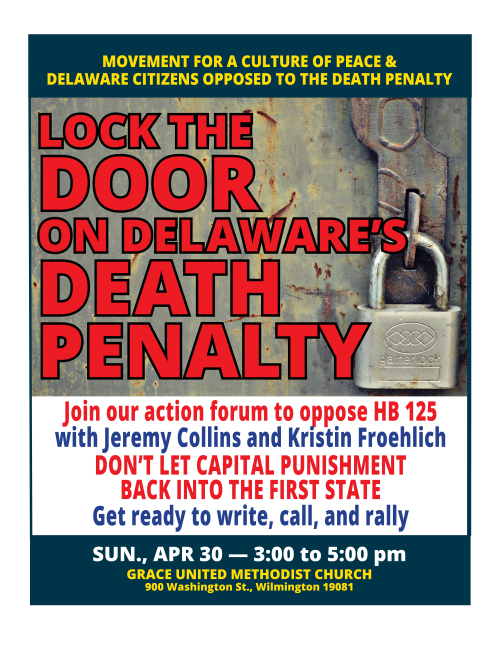 Movement for a Culture of Peace (MCP) is teaming up with Delaware Citizens Against the Death Penalty (DCODP) and other groups to take action to defeat HB 125, which seeks to restore capital punishment in the First State. Delaware’s former death penalty statute was declared unconstitutional last year by the state supreme court. To read the full text of HB 125, click here. We need to act now to stop HB 125, which is currently in the House Judiciary Committee. The hearing for the bill is expected to be in early May. After opening remarks from civil rights attorney Jeremy Collins and Kristin Froehlich, vice president of DCODP, we’ll get to work writing letters, making posters, and preparing to rally against capital punishment at Legislative Hall. Persons interested in testifying against the bill may receive training and tips on how to be most effective. We are most powerful and persuasive when we work together. >Please help us publicize by printing and distributing our poster and mentioning this meeting on social media. You will find various versions of this graphic on the Movement for a Culture of Peace Resources Page. This entry was posted in Action, Delaware, Events, Legislation. Bookmark the permalink.